Haven't felt your lats for a while? You will after trying these novel variations of staple back-building movements like the pull-down, pull-up, and row! Your workouts can sometimes feel like a meal you've been eating every day for years. On back day, it's rows and pull-downs. Next time, rows and pull-ups. And for the truly inspired, flip the script and you've got pull-ups and rows. But not today. Instead of serving the same ol' dish, we fired the chef and came up with a menu of all-new back-day fare. So let's toss out the old—including this tired kitchen metaphor—with six new exercises worth a try in your back workout. What it is: This variation of the single-arm dumbbell row uses a barbell anchored at one end, either into a landmine hosel or into a corner (with some towels to keep the wall from getting chewed up). Some people find this setup allows them to achieve a greater range of motion than either the barbell or dumbbell provides. You can also load this surprisingly heavily. 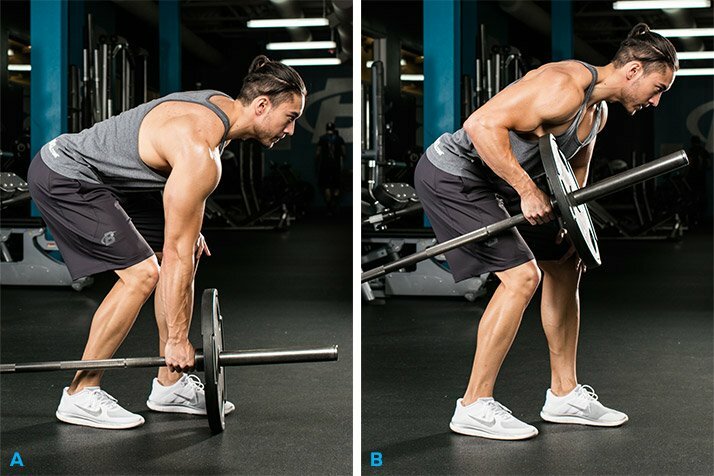 About this move: Set up so the barbell is along your side (an alternate version with the barbell perpendicular to you is known as a "Meadows row"). With your chest up and back flat, bend over and grasp the bar near the collar with a neutral grip, keeping your knees bent. Pull your elbow as high as possible, but don't twist your body; keep it square and facing forward. Always keep your head neutrally aligned as well. Key training tip: If you have trouble maintaining a flat back, consider a split stance (inside foot back) while placing your outside elbow across your outside knee for added back support. What it is: The decline position of this version of the pull-over places more focus on the lats than the flat-bench pull-over while reducing the degree of stress on the chest. Not only will you achieve a greater range of motion than the flat-bench version, but also greater time under tension on the lats—the lower lats in particular, in my experience. About this move: Choose a bench that has about a 45-degree decline, and set a single dumbbell on the ground at its base. Hook your legs under the rest, and reach back for the weight. Your arms should be nearly straight, but your elbows should be unlocked and stay in more or less the same position throughout the movement. Pull the weight up to a point somewhere over your chest, really focusing on pulling with your lats. Key training tip: This is a single-joint movement, so don't try to turn it into a powerlift. Go light, and do it last in your workout after all your other back exercises for 3 sets of 10-15 reps.
What it is: This isn't a new exercise per se but rather a technique applied to the pull-up. Here, the focus isn't on the concentric but rather the eccentric contraction. Resisting the negative gives a powerful contraction under stretch to the lat fibers, which is a great way to spur new growth. Plus, since you're stronger in the eccentric of a movement than the concentric, you should be able to really work your lats to exhaustion. About this move: To do negatives, position a stool beneath you so you're able to stand or jump back to the top position, and take 3-5 seconds to lower yourself, going very slowly and under control. End your set when you can no longer control the descent or it takes fewer than about three seconds. Key training tip: Don't give in to the temptation to do any positive reps—although this technique can definitely boost your pull-up numbers down the road. For now, really fight the descent—that's what this technique is all about. What it is: This row variation simply replaces the close-grip handle bar with a D-handle, so you're working each side individually. This change helps gives you more range of motion as well as more grip options: neutral (palm-in), overhand, underhand, or perhaps best of all, rotate your palm, turning it up (or down) as you pull, which gives you a whole new feeling. About this move Set yourself up like you're doing a seated cable row with your knees bent and back slightly arched, sitting up tall. Grasp the handle with one hand, pulling your elbow as far back as possible without twisting your body to the side. Retract your shoulder blade, and give the middle-back musculature a momentary squeeze before allowing the weight to pull your arm back to the start position. Key training tip: Keep your body square to the unit rather than twisting your torso as you pull, which recruits the obliques into the motion. Maintain a fairly upright torso; leaning excessively forward and backward during the motion calls the lower-back musculature into the movement. What it is: Instead of using a lat pull-down station, here you'll change the angle of pull by positioning yourself on your knees between two upper pulleys (cable-cross-over station or FreeMotion-type unit). You won't be using as much weight, because there's no way to anchor yourself down, but it's a great pumping movement for the end of your workout, and you'll really be able to cramp down on those lats. About this move: Set the cables to the top position, and take off the handles. That's right—you'll be grasping just the rubber balls. Walk over to each side and take the right-side cable in your right hand and left-side cable in your left, holding the ball between your thumb and index finger. Center yourself, and drop to your knees, keeping your torso erect with your chest out. Rotate your hands so that your grip is slightly underhand. Smoothly drive your elbows into your sides, squeezing your lats in the peak-contracted position. Keep reps moderate to high, like 10-15. Key training tip: Make sure you're positioned exactly midway and in line with the cables; if one side feels heavier than the other or the movement paths feel asymmetrical, you're probably off-center. What it is: With the bar locked in a set path, you don't need to worry about controlling the weight. Just load up and start hammering the lats! Because your elbow stays tight to your side as you pull, the emphasis is on the lower lats. This shouldn't be your primary row variation, but it's a great one for adding some heavy volume on your back day and emphasizing the stretch at the bottom. About this move: It may seem as simple as can be, but getting your body set in the optimal position for pulling is still tricky. Set the bar near the bottom of the Smith apparatus, and disengage the safeties so the bar can approach the floor. Stand sideways to the unit, toward the center of the bar. Bend over about 45 degrees with a flat back, and place your outside hand on your knee for support. Use a split stance for balance with knees bent and your rear foot almost under the bar. Grasp the bar near the center with your inside hand using a neutral grip, arm extended. Keep your shoulders square, chest out, and your back flat throughout. Don't rise up from the bent-over position as you pull the weight. Pull the bar upward by driving your elbow toward the ceiling and squeezing your shoulder blades together. The bar should nearly graze your side as you pull it upward. Squeeze hard at the top for a count before slowly lowering to the start and feeling a good stretch in your lats. Key training tip: This may feel awkward at first, so go light until you get the hang of the movement. Do this toward the middle of your workout, after your heavy bilateral rows or other strength work. Perform 3 sets of 8-12 reps.